I received this letter from Mr. George Koukoudakis, the Mayor of Hydra. More than 200 Forum members spent a memorable weekend (many of us longer!) on the island in June. We also had a great time during your stay in Hydra. It was an honour for us. I would like to thank you and the members of the forum you represent for the help you provide to the Island of Hydra and especially for those in need. Soon we will propose to you some social care projects of the Municipality (social supermarket, social pharmacy etc) that the money you want to donate can be devided. 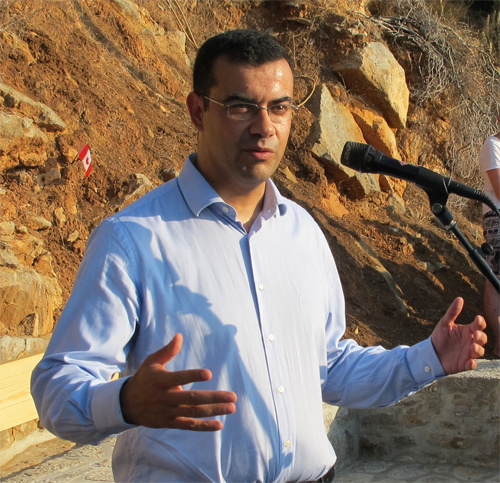 Meanwhile i would like to inform you that on the 13th of July the Ambassadoe of Canada in Greece was in Hydra. I ask him to help the Municipality of Hydra to establish twinning relationship with the Municipality of Montreal, the birth place of Leonard Cohen. I want to ask your help and the help of your forum towards this goal. We will be in touch for both of the aforementioned issues. Thank yoy very much for your help and co-operation. I would also like to express my warm congratulations for the wonderfu work you are doing. for free or with very low-cost basic goods and medicine. and her husband Koulis would have been two of them). So I am totally in support of such projects. Looks for me a perfect way to spend the extra money on these social projects. o we promised to make a photo book with names of all donators and photos from our Hydra happenings; it will be done before the next Meetup and the book will be deposited at the Museum of Hydra (+a copy to the Municipality as well). Very well chosen! Thank you for the tremendous effort you , and all that have helped you, to make all these things happen! Thank you very much for your email. Your decision to make a donation to the Social Supermaket and Social Pharmacy of the Municipality of Hydra is an excellent gesture of solidarity to the people in need. Thank you once again for your help and support to the people in need in Hydra. Thank you for the updates Jarkko. I will admit I had some concerns about what would happen to the surplus funds but I am very happy with the result. It is also nice to know that Gideon was able to confirm that this was in accord with Leonard's wishes (though I don't think any of us would have doubted he would approve). Will it be possible for those who wish to obtain a souvenir to buy a copy of the photobook?